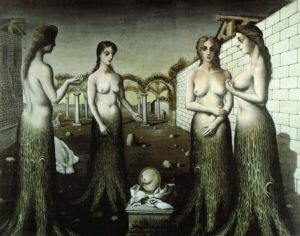 I started researching Surrealism, more specifically Women Surrealists, over ten years ago, writing both my M.A. dissertation and then my PhD thesis on the subject. 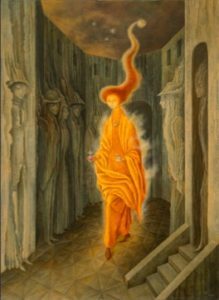 I have a particular interest with Surrealism’s connections to the female body, fashion, and magic/alchemy/witchcraft, but the movement is wide and its influence felt in many places. 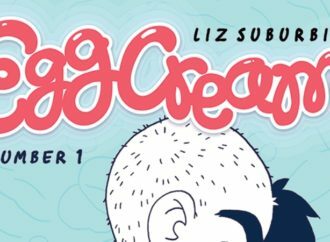 As a result, I am constantly creating imaginary Venn diagrams noting how particular paintings/creations overlap into other platforms, and how much the art permeates so many different areas of culture, the smallest corners and the most unexpected of places. However, when you look and compare, these comparisons, these contrasts make perfect sense. 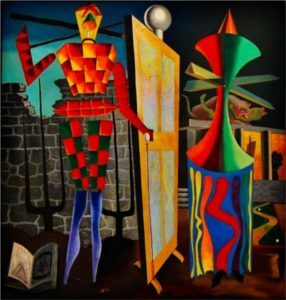 Surrealism as a movement can be traced to Paris 1924, the Manifeste du surrealism (The Surrealist Manifesto) and the ‘bureau des recherches surrealists’, and the establishment of the ‘bureau des recherches surréalistes’ (The bureau of surrealist research). From encompassing a variety of artistic practices (from painting to sculpture and photography to filmmaking) the movement was primarily concerned with the freedom of the unconscious mind and uniting dreams and consciousness. 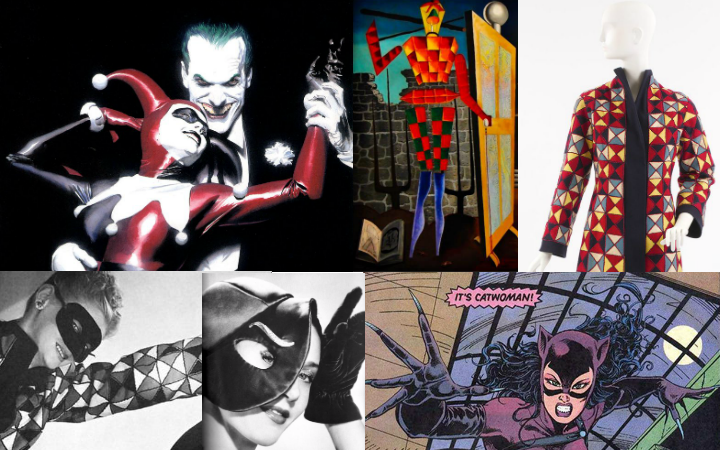 While preparing a recent lecture on the Surrealist couturier Elsa Schiaparelli, I glanced at PowerPoint images together and could not help noticing the likeness between her designs and some well-known comic book illustrations. 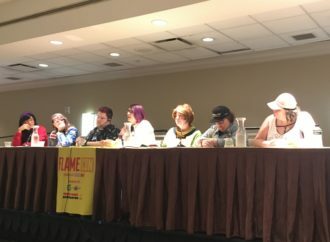 When I tweeted out the first on this list, my Harley Quinn comparison, the response was one of delight, something that made me realize that they had to be more. As I continued to write I could see that there were others. 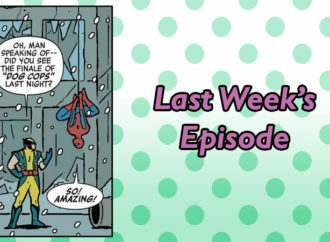 While the Harlequin coat proved a key starting point on this task, I could not help discovering similarities in other comics too, in relation to Schiaparelli. (The one that was decided to sneak into my lecture even elicited a cheer from my kind audience). 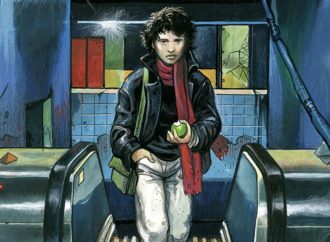 Some of the comparisons are subtle, some are vintage illustrations, and others are taken from recent years. Although I realize some artists may have taken subconscious influence from various art movements and found inspiration in various paintings, these are my own personal choices: a growing file of images that continues to grow. 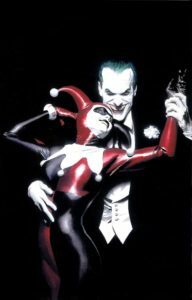 Batman: Harley Quinn, cover by Alex Ross (DC Comics, 2015). Schiaparelli clothed harlequins, photo by Erwin Blumenfeld for Vogue (1 December 1938). 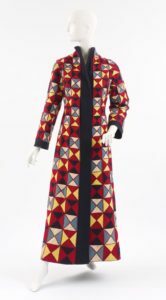 Elsa Schiaparelli, “Harlequin” Evening Coat (Commedia dell’arte Collection) (Spring 1939). Man Ray, Le Beau Temps (1939). 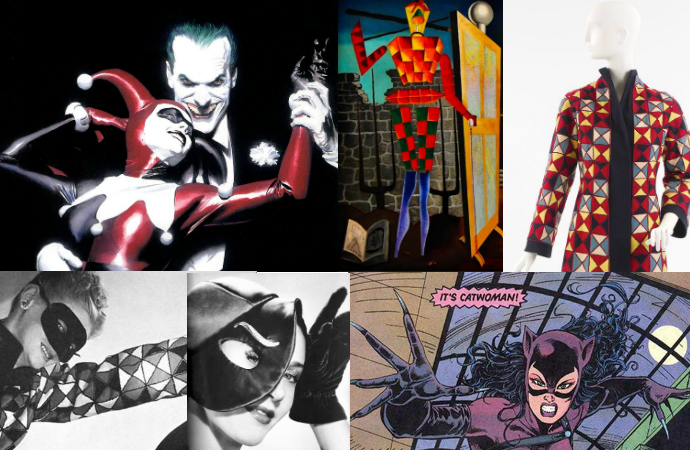 Schiaparelli clothed harlequins, photo by Erwin Blumenfeld for Vogue (1 December 1938) // Elsa Schiaparelli, “Harlequin” Evening Coat (Commedia dell’arte Collection) (Spring 1939) // Man Ray, Le Beau Temps (1939) // DC Comics Batman: Harley Quinn, cover by Alex Ross (2015). As one of her five thematic collections of 1938,. Elsa Schiaparelli’s Harlequin coat was part of her commedia dell’arte theatre traditions of the 16th-18th Century. 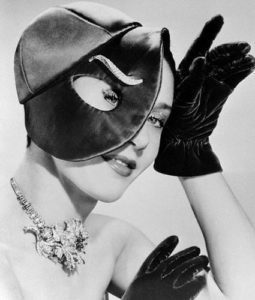 Masks were a major part of this tradition, and in the Cecil Beaton photograph, taken the previous year, there is something of the superhero about it: a sense of play, of mischief, and of wonder. While Man Ray’s Le Beau Temps (1939) mirrors the chequered design so associated with the harlequin figure, the Alex Ross cover of the eponymous character unusually mirrors the photograph’s roguishness and devilry. 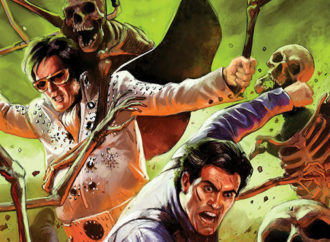 A sense of chaos about it ensues. Another highlight from Schiaparelli, her hat with the cut-out eye perfectly mimics a cat bowl made so famous by DC’s most famous feline. 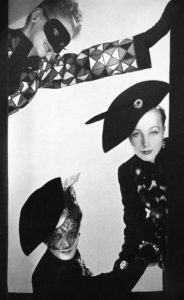 Schiaparelli’s models often exuded a playfulness that conspired perfectly with the Surreality of her designs. While some of her outfits were demure, the more artistic ones would have been perfect for off-duty superheroes. 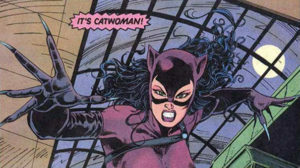 The Eye Hat was made to be worn by vintage Selina Kyle. Remedios Varo’s La Llamada (The Call) (1961) is a multi-layered painting infused with the her interests including mythology and symbolism. Like the previous Les Feuilles Mortes, there are apparent connections to ancient worlds, deities and magic. In this example, we can connect it to astrology and the gold of the sun, the Leo sign, and the sovereign of the solar system. However, this is not a stereotypically ‘masculine’ painting as the figure is delicate, androgynous, and plays on Varo’s own appearance. 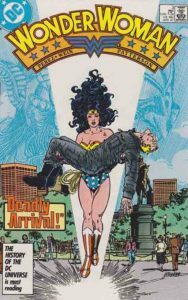 Diana’s strength is evident as she holds an unconscious man in her arms following a rescue mission, either landing or about to leave, as she too appears to hover. 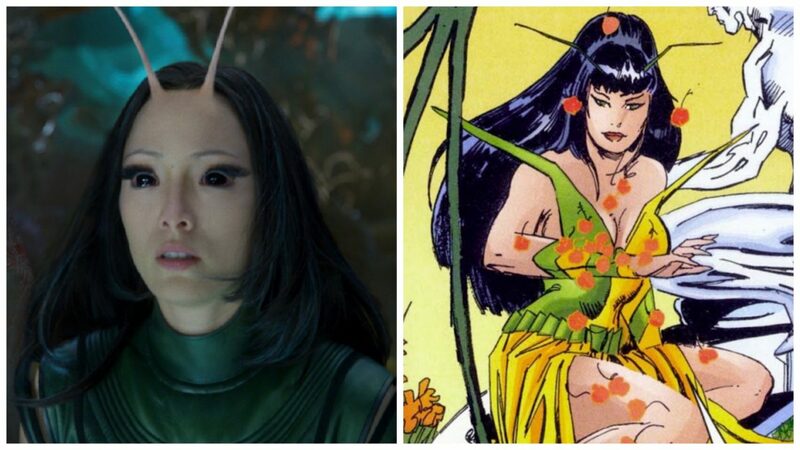 Both have similar ‘levitating’ hair and are engulfed in light. Fundamentally, it is a depiction of strength: two goddesses, one of the sun, the other an amazonian queen/demi-goddess, both with innumerable strength and power, both internal and external, at their disposal. Remedios Varo, Les Feuilles Mortes (1956). 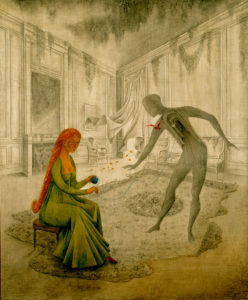 In Remedios Varo’s exquisite rendering of ‘Dead Leaves,’ we see a figure with a hollow chest of vacant halls and infinite possibilities: death, rebirth, and eternity. She is alive yet in a room of death, alive yet an apparition. 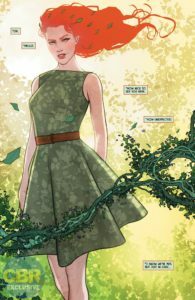 In Mikel Janin’s cover image of Ivy, the leaves twine around her and off the page, both encasing and liberating this most wonderful of Batman’s nemeses in one of the summer’s most talked about comic book series. Varo’s is painting is darker in tone, depicting a seated woman winding a ball of twine in a ghostly room. The wool reaches into the chest of a silhouetted shadow who bows in a courtly gesture before her, an exposed rib cage composed of endless corridors which, like the wool, appears to span infinity. Ivy appears to have been birthed by nature, an apparition having manifested from the whorl of leaves. 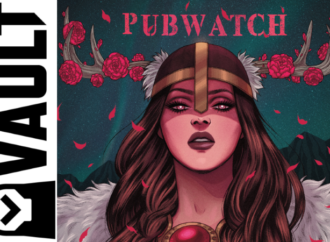 Both women wear vibrant green and flaming red hair and stand alive among the spirits. In the Paul Deveux’s 1937 painting The Break of Day (L’Auroure), woman and tree become one entity. 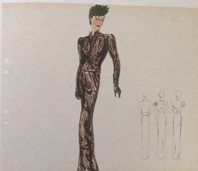 This fusion was emulated by Schiaparelli when she introduced a variety of rayon crêpe called “treebark”, which she used for her form-fitting evening gowns. Other similar pieces included a dinner ensemble based on a brown-and-white satin print made to imitate wood grain, while leaves became a major motif. In another outfit we can see how this evening attire consists of varying shades of green taffeta sewn to pale green organdy to make up a waist-length cape that was to be worn over a white crêpe gown printed with fauns gambling through a body coloured rustic setting. 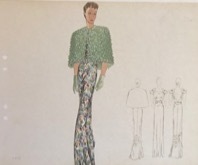 There was also a jacket, detailed on this sketch, which fastened at the waist with a green plastic leaf and worn with a leaf-coloured hat and green gloves. Although maybe not as similar as some of the other images I have included, the entire “women at one with foliage” is pure Ivy; the leaves winding around her both ‘birthing’ the greenery as she is emerges from it. 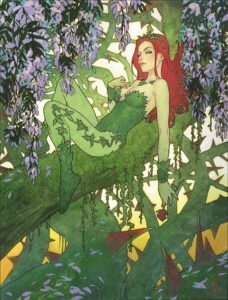 The same can be said for Joshua Middleton’s depiction of Ivy. As we look to her leg and feet, they merge with the moss of the tree, woman and nature as one, at nature and in possession of its inherent power. This is just a taster of what I have noticed and I’m aware there are many other comparisons—not only inspired by Surrealism, but other movements and artists. Art inspires art, and every creator will have their favorites, whether the Renaissance or Pop, Expressionism or Surrealism, as they draw inspiration from a particular painting or artist, colour palettes, forms, or even proportions. There’s a world of comparisons out there, and I’m eager to find more. Stunning application of Surrealism. Comedy should include a certain surrealist modas operandi. I’m taken back by the use of Venn diagrams as I am currently using them to show genre overlap in Surrealism. Further, I focus on the woman/muse/prostitute and the patriarchal objectification of the male Surrealist. Yes, Breton was an arrogant, misogynist, homophone who kept Cocteau out, but let Crevel and Cesariny in, which boggles the mind. I find true Surrealism in its woman members, such as Claude Cahun, and homosexual non-members like Cocteau. Interesting writing.